The Alhambra was built in 1912, at a cost of £20,000, by Francis Laidler [1867-1955] who was already well established in the world of pantomime from his work at the Prince’s Theatre, Bradford. The doors opened in 1914 with Francis as proprietor, who became known as the ‘King of Pantomime’ with many of the productions he authored touring the country. With vast records held including posters, scripts and programmes, find out the history of the ‘North’s premiere touring venue’ that is still entertaining the masses today. 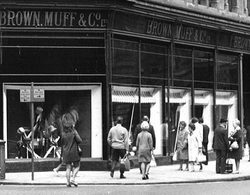 Renowned for its luxury goods, Brown Muffs was founded in 1814 by Mrs Elizabeth Brown, and before long was selling ready fitted clothes and underwear, as well as having a book shop and library! Her son Henry took over the store, and went into partnership with his brother-in-law, Thomas Muff, in 1845. The business continued to expand rapidly, until the economic climate in the 1970s led to its takeover by Birmingham based company Rackhams, and eventual closure. We have many records for Brown Muff and Co. including photographs of it’s departments and famous window displays, staff magazines, minutes and account books, all showing just why this store was known as ‘The Harrods of the North’. 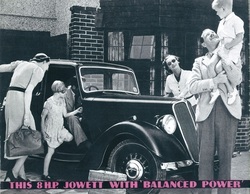 The Jowett Car Club collection, consisting of over thirty boxes of material collected and created by the car club, represents a treasure trove of information about one of Bradford’s most famous companies. The records include Jowett road tests from early editions of motoring magazines such as Autocar and The Motor, instruction books, sales catalogues, illustrated price lists, spare parts lists, technical diagrams and maintenance information, and repair notes. Oriental Arts is an organisation providing South Asian arts activities such as concert promotion, artistic programming for occasions such as melas, music events and festivals, and they also showcase many artists. They are still actively contributing to the community, and are celebrating their 35th birthday this year. From newspaper cuttings, pictures and sketches he drew himself, we can learn a great deal about the inhabitants of Bradford and the surrounding towns, such as who lived where and who worked in what trade. The drawings show us many old buildings that were knocked down to make way for new improvements as it expanded into a city, allowing us to see what the town once looked like.